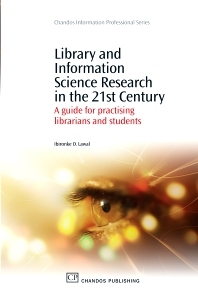 Introduction; The significance of research in the library and information profession; Overview of the research process; Research designs; Data collection; Data collection; Data analysis; Collaboration; Preparing and publishing research reports; Conclusions. The first of its kind, this book provides a theoretically informed research guide and draws attention to areas of potential research in Library and Information Science. It explores the nexus of theory and practice and offers suggestions for collaborative projects. The clear text, simple style and rich content make the book an invaluable resource for students, scholars and practicing librarians, as well as the general reader who may be interested in library and information science research. Ibironke Lawal is currently Associate Professor and Librarian for Engineering & Science at Virginia Commonwealth University, Richmond, Virginia. Her article Scholarly Communication: The use and non-use of E-print archives for the dissemination of scientific information, published in Issues in Science and Technology Librarianship, Fall, 2002, Available at: http://www.istl.org/02-fall/article3.html won the ASEE-ELD Best Paper Award 2003.